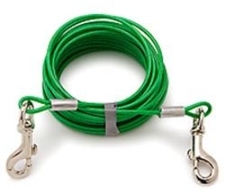 These tie out cables are ideal for keeping your dog at home. Strong cables for even the largest dogs. 12' long cable for dogs up to 10 lbs. Strong cables for even the largest dogs.